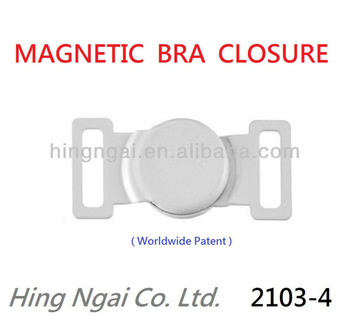 The magnetic bra closure provides convenience and independence for women's various intimate apparel needs. Hing Ngai Co., Ltd. in partnership with japan Aoki Metal Industry Co. Ltd. and Randolph-Rand Corporation in the USA ever since 1983 has been manufacturing patent magnetic buttons for various famous handbag brands, exporting products to clients from all over the world and producing the only patent magnetic buttons that are allowed to be imported to the USA. We have our own factory in Shenzhen.We adopt automatic or semi-automatic production lines with an in-house electroplating department, making the production of products in different colors possible. Our factory is capable of producing 50,000 to 60,000 sets of high-end magnetic buttons for famous international brands. For magnetic buttons, we have over a hundred types. We also produce magnet and other metal plastic accessories. Our company has a number of world-class handbag manufacturer clients. With the continuous support of these demanding clients, our production capacity has soared over the past 28 years and is growing to be the world number one manufacturer in producing the highest quality and widest range of magnetic button products for famous brands. Contact us right away to get a more detail and complete catalogue of our products. For more information,pls feel free to contact us, thank you!